The Porter Cable 7424XP Dual Action Polisher delivers safe, swirl-free polishing action. 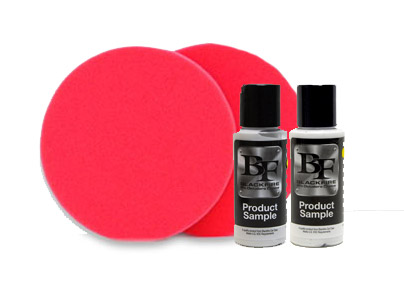 Kit includes a variety of foam pads for swirl removal, polishing, and waxing. Two size backing plates are included. The Perfect Porter Cable 7424XP Starter Kit supplies you with all the necessary gear to start polishing and protecting your vehicle with the Porter Cable. You won't find a more complete kit for spot repair and all-over paint care. The Dual Action 5 inch Flexible Hook and Loop Backing Plate� is constructed of urethane has hook and loop material permanently secured from edge to edge. A recessed edge protects the paint from impact and the post is made of durable stainless steel. The 5/16 inch thread fits any dual action polisher with a corresponding thread. Two CCS White 6.5 Inch Heavy Polishing Foam Pads are designed to apply cleaner waxes, micro-fine polishes, and light swirl removers. The foam is less dense than a cutting pad but more dense than a finishing pad. Two CCS Black 6.5 Inch Finishing Foam Pad will apply waxes and paint sealants flawlessly. The soft foam is firm enough to remove light buffer swirls during final finishing. Two 16 x 16 inch Cobra Microfiber Polishing Cloths make product removal easy with tiny, looped fibers that grab wax and polish residue. Each towel is made of a soft 70/30 microfiber. 8 oz. BLACKFIRE Advanced Pad Cleaner BLACKFIRE Advanced Pad Cleaner prolongs the usefulness of your buffing pads by removing product residues. When pads are cleaned thoroughly after every use, they maintain their texture and performance far longer. You'll save money and you'll get better results with your existing pads. Use Blackfire Advanced Pad Cleaner to clean foam and wool pads after every detail. 8 oz. BLACKFIRE Advanced Pad Conditioner BLACKFIRE Advanced Pad Conditioner makes machine detailing easier by reducing friction between the pad and the paint. Products glide on more smoothly and the paint is protected from dry buffing. BLACKFIRE Advanced Pad Conditioner reduces skipping or sticking of the pad. Use it every time to prime your pads for perfection. 3.5 Inch Dual Action Flexible Backing Plate works with the included 4 inch pads. The reinforced inner construction uses steel struts molded into the center hub to give the plate stability and maintain an even surface for your pad. Four 4 Inch Lake Country Orange Light Cutting Pads are useful for spot repair and swirl removal. These small pads can remove mild to moderate imperfections when used with a swirl remover. The Perfect Porter Cable 7424XP Starter Kit is a great choice for those who are new to machine polishing. A total retail value of $282.88. Save $52.89! ProsThe shipment was missing the DVDs. After a phone call, the DVDs was sent out that day. Very nice buying experience. Would recommend to anyone. I wanted to step up my auto detail hobby, and produce some professional results. The how to video was vital, and the machine and pads were great. Was blown away from the difference between what this machine produces compared to doing this task by hand. Would highly suggest this to the car enthusiest that is wanting to step up there game and go toe to toe with the pro's. Great product!!!!!! ProsThe package I bought was everything to get started in a professional manner. ConsThe video should suggest taping off your moldings to prevent sloppiness. The advice to put pad on car before starting was vital. Would not of known this. It worked better than I expected. I've never used a polisher before, but this one was everything I had hoped for. ConsHaven't found any so far. As a beginner, after reading tutorials + watching several videos, this kit looks like it has virtually everything U need to do an excel lent job. It also includes several items I had not yet thought of but would definitely want.